How many times have you thought to yourself ‘wouldn’t it be nice to get away from it all for a few days, really get away from it all?’ short of flying somewhere your options can be limited in escaping the glitz and the glamour of the UAE without compromising on sheer luxury. We have found the answer. Banyan Tree Al Wadi is the ultimate hideaway resort, nestled amongst the soaring sand dunes of Ras Al Khaimah, only an hours drive away from Dubai. 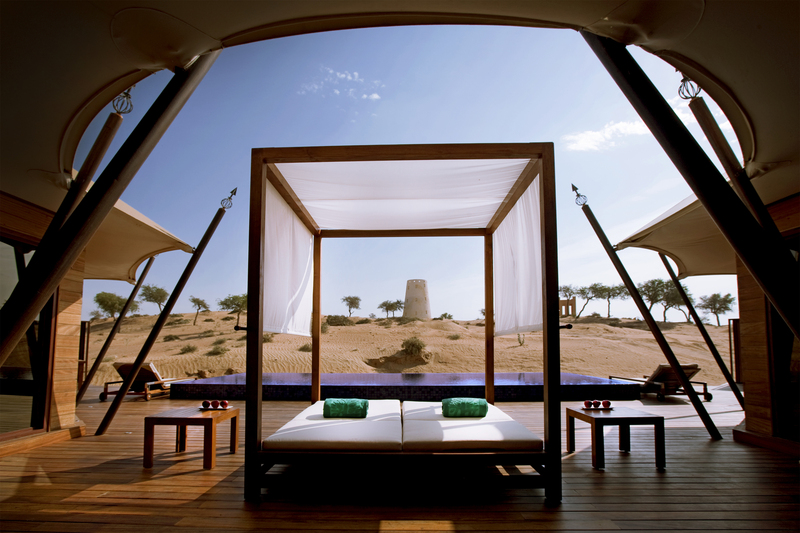 Banyan Tree is synonymous with luxury accommodation and Al Wadi is certainly no exception. With each Banyan Tree property unique and reflective of its surroundings, Al Wadi is a true delight to the senses. The resort is located in the tranquil Wadi Khaedja, a protected enclave of the evergreen ghaf tree and Banyan Tree Al Wadi is so proud of its location it even boasts its own dedicated nature reserve. From the drive up to the resort, along the winding road through acres of desert and up to the security gates, you come quickly to the assumption that this resort is all about privacy. Of course, as with any good hotel in the UAE it even boasts its own helipads for those guests that prefer to arrive by air. The resort is the first of its kind in the UAE complete with an all-pool villa concept of accommodation, outstanding hydrotherapy spa facilities, the mentioned nature reserve and access to the beach at Ras Al Khaimah courtesy of a complimentary shuttle service. Whisked through check-in you are escorted to your accommodation via golf buggy, which is the means of getting around at the expansive Al Wadi resort. There are 70 Al Rimal Deluxe Pool Villas and just over 30 Tented Pool Villas all entirely private and respectful to their guests needs. There is a reason this resort is called a honeymooners paradise. You simply don’t have to see another person other than your significant other should you so wish. We opted for one of the deluxe pool villas that were set amongst the sand dunes. Each villa is a contemporary adaptation of traditional Arabic architecture and a tribute to the local heritage. Think lashings of dark polished wood, high ceilings, elaborate Arabic-style lattice woodwork, metallic draping and intricate arabesque carvings. The only part of the huge villa that didn’t seem to pay homage to the Arabian culture was the stark white bathroom which was not only enormous but beautifully designed. The large ornate bath took pride of place in the room reflecting against the exposed windows so you can enjoy a soak in the tub whilst gazing out onto the colourful blooms of the garden. Each villa has a dressing room, large bedroom and a living area complete with plasma TV, audio system and free wifi. Of course it has free wifi, this is not your average resort for your average guest. What is better is that each of these perfectly compact villas comes complete with its own temperature-controlled infinity pool so you can laze in the desert sunshine whilst admiring the simply stunning view of the desert oasis in which you are staying, completely oblivious to your next door neighbours. If you’re feeling flash or for simply even greater privacy (not to mention luxury) we cannot recommend enough one of the Al Khaimah and Al Sahari tented pool villas. A Bedouin style dwelling is the ultimate in luxury experiences. Set into the landscape and each one all on their own, these properties are an oasis of serenity. A sprawling two-roomed property of around 250sqm under a flowing canopied ceiling with a dedicated villa host (yes, you get your own butler) is the romantic hideaway. If the lavish interior doesn’t stun you into a state of wonder the huge outdoor terrace complete with bed, loungers and infinity pool seemingly merging into the dunes like a mirage will leave you never wanting to return to real life. If however, you do want to explore the resort there is plenty to keep everyone entertained. The spa is not only award-winning but a real treat. With four royal and six deluxe treatment pavilions while away the hours with a sensory massage or for a range of hydrothermal wellness facilities make sure you pay a visit to The Rainforest where circuit training just got a lot more fun. Hop around The Rainforest indulging in each numbered treat from thunderstorm showers to the actually rather pleasant ice room, you will leave feeling brand new. There is also a fully equipped fitness centre and yoga studio for those that can’t break their schedule. Our favourite thing about Banyan Tree Al Wadi has to be their activity centre. Fancy a spot of falconry? Or perhaps a Wadi safari observing the breadth of nature that calls the area around this resort their home? There is a chance to observe and interact with a variety of creatures that form part of the 60-hectare nature reserve. Of course, all this lazing around will work up an appetite and the resort offers numerous dining and lounge options. Try Safan, the signature restaurant which offers up contemporary Thai cuisine as you dine al fresco under the stars, if you’re lucky you might even spot an Oryx also feeding at the lake. The Moon Bar is a great spot to watch the sun go down, perched onto of the Samar Lounge. Treat yourself to one of the many delicious cocktails or a spot of shisha and watch the blazing sun disappear behind the dunes and be replaced by a majestic splattering of stars across the inky night sky. Banyan Tree Al Wadi is one of those hotels that is really quite difficult to leave. It allows you to relax in a way that other surrounding hotels don’t quite manage, such is the privacy that it offers. It’s all about the experience here, whether its fine food,wellness,being at one with nature or simply getting away from it all for a while, it is impossible to fault in any way. Of course, this level of exclusivity doesn’t come cheap but every once in a while isn’t the ultimate extravagance just having some time to yourself? If you can do that in faultless surroundings then we say it’s priceless. The Baynan Tree Al Wadi looks more than just amazing. So luxurious and enjoyable. Just unbelievable!